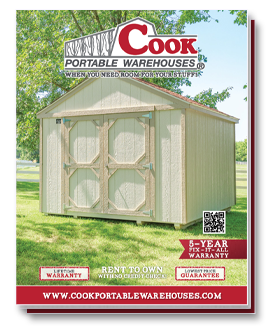 Cook has just introduced 5 new shed styles this year to meet your need! Each of these shed styles has custom options so you can make it truly your own. Plus, with the rent to own program, if you discover your shed is too small you can trade up to a larger shed size or style. What custom options do we offer? Does our lifetime warranty cover these new shed styles? Absolutely. Each of our shed styles has a lifetime warranty on all treated components. The superior value of these treated components (including the floor skids, floor joists, floor decking and siding) allows Cook to extend a lifetime warranty against structural damage caused by termites or fungal decay on all exposed wood components. Read about our other warranty details here. Now, let’s take a look at these new shed styles. Each one has a variety of different features and can be customized the way you need it to be. Customers are using them simply for storage, to build a home office, she shed, man cave, workshop or hobby space. With a Cook building as your blank canvas, all the possibilities might surprise you. NOTE: While you’re paying off your shed, you can dream and plan about the modifications you’ll make. Then, once it’s paid in full, you can add any permanent modifications you’ve been wanting, like electricity or insulation. Are you living in a city neighborhood or in an HOA community? This is a great solution. 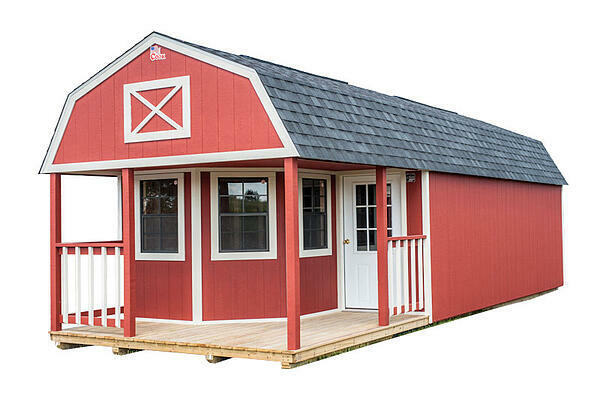 As long as you have an 8’ opening into your backyard, we should be able to install our smallest shed. It’s designed to sit right up against your house, to give it the feel it’s simply a small extension. It will provide you with the added storage you need right outside your back door. 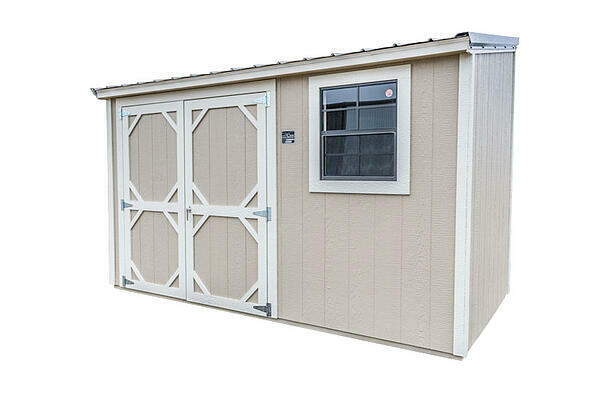 The slim shed comes in one size, 6’ x 12’, with double doors and a window. When you need more space, but have a small yard, this is the solution we recommend looking at first. Take a tour of it! This style takes our simple Utility design and takes it to a new level. You’ll enjoy having a 6’ front porch, 4 windows and a door with a 9-light window. This is a great solution if you’re looking for a hobby space, a workshop or a larger garden shed. 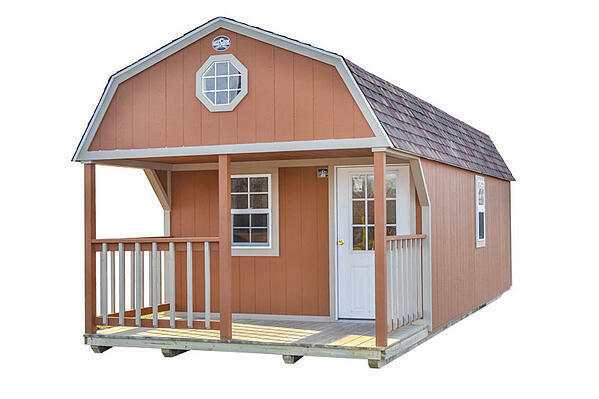 Each of our cabin styles come in 12’ wide buildings, though in some areas we also offer a 14’ wide building. See all of the details about this shed option! The Premium Utility Cabin is the perfect mix between function and style. We took the standard utility shed and added a stylish bay window and 4’ porch. It’s a great solution for many homeowners and business owners. It can be a storefront, an office or a hobby space. 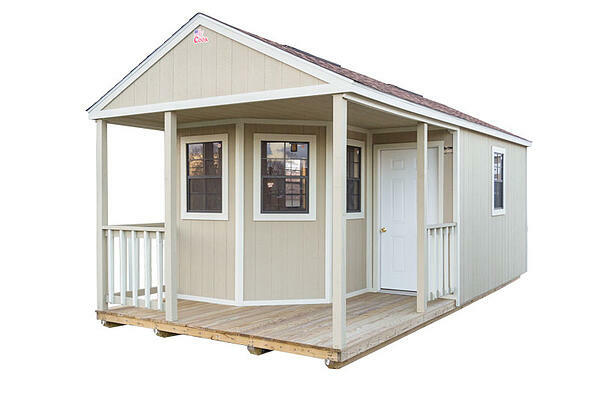 Just like all of our shed styles, it is eligible for our rent to own program with no credit check. Learn more about this cabin option. It’s amazing how adding a loft can make such a difference in your storage abilities. This cabin gives you style, functionality and maximum storage space. This cabin features three windows, a 6’ front porch and a door with a 9-light window. 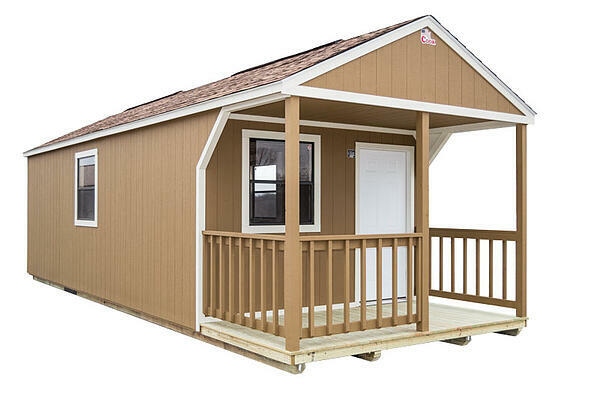 You have the option to rent to own this cabin style which provides you with the space you need within your budget. Even if you have your shed custom built, you can still rent to own. See the specs and more details about the Standard Lofted Cabin. If you need storage but want style and plenty of natural light, this is the right choice for you. This lofted cabin has 5 windows, a door with a 9-light window and a loft above the bay window. If you’re not sure on the size shed you need, remember that our rent to own program allows you to trade up later if you decide you’ve chosen the wrong size. See all the details of the Premium Lofted Cabin. If you’re thinking about purchasing any of these portable buildings, you can find your local dealer or call our corporate office directly. Our internet sales facilitator is there to help you find not only the building you need, but the building you’ll love.